A mum and her young daughter came in yesterday. The mum explained she’d bought a special necklace but it needed a shorter and more special chain than the one it came with. The young 3? year old refused to allow us to remove the necklace from her neck, or perhaps I should say, tried to refuse as the mother succeeded, despite the howls and much protestation. The wee little girl cried the whole time we swapped the chain and attempted to put it back on her. The mother was clearly frustrated and I sure was able to identify with this as she tried numerous strategies to get what she wanted done. Despite her annoyance, her strategies also included logic and she asked her daughter great questions to find out what she was so distressed about. Her eyes were open so wide and her expression said so much yet her mouth gaped and no words came out. In a new instant, I decided to see from a different perspective than I might have been able if I was either of them in th midst of the turmoil. Like hindsight, doesn’t distance aid clear thinking and wisdom?!! Sometimes we don’t have the words to explain ourselves. Sometimes, in that moment, we don’t know why either. We agreed this was true and that we were both adults with skills and experience and then we compared ourselves with this distressed mite, less than half our size but with more frustration than both of us combined. The Mum then made a decision to purchase the chain and leave the shop. I could hear the little one crying still minutes later in the street. Both the mum and I had made really intelligent and thoughtful guesses and thought we were clever in what we said to help and we failed. I wonder what it was really all about? I wonder if they were able to talk about it calmly later? I wonder what you would have done? I wonder what this brings up for you now? How often do you laugh at yourself? I laugh at myself rather a lot!!! Today one of my customers mentioned as a ‘by the by’ that they had read my last newsletter and loved it. Instantly I was more alert, if I were a dog my ears would have been pricked and my response would have been heard as sharp, quick bursts of yapping. A rapid series of questions to establish that yes, she had meant my blog…so I laughed and asked if I could admit that I had heaps to write about and expected to be writing often BUT nobody had commented and so I hadn’t written anything more. A new blog with no responses, it looked sad and somewhat shameful to me. How could I write another? No one I knew had even signed up (forgive me to the two bloggers who did!) What was the point? So she laughed with me and made it her fault a bit, she’d been going to comment…She kindly told me that I should keep writing because I was good at it. Some of the writing I do helps me. Journaling kind of stuff that gets it out of your head and enables you to see a situation with more clarity. A blog isn’t about talking to yourself though but now that I know I have an audience, I’m happy! I’ve recently learnt that a lot of what I have been including in the Main Street Revelations’ Newsletter would better suit a blog format. I love the idea that you can choose to communicate with me and other lovers of Main Street Revelations in this medium. Today it is rather cold, wet and windy here in Foster. So far, I have had exactly 9 people through the door and every single person has made a purchase. This is not common. Our tagline after all is, ‘Browsers Always Welcome’. Half of my customers today have been tourists who just pull on the appropriate gear and get on with it! They were delighted to find less touristy gifts to take home with them. I’ve had a couple of locals who raced in, grabbed what they needed and left again! What’s been obvious though is that everyone today has been focused. They’ve come in for a purpose intent on achieving success. This makes my day rather easy! Beautiful things attract beautiful people. Does that sound trite? I hope not, because I see it all the time. It’s a universal law too isn’t it? Like attracts Like. 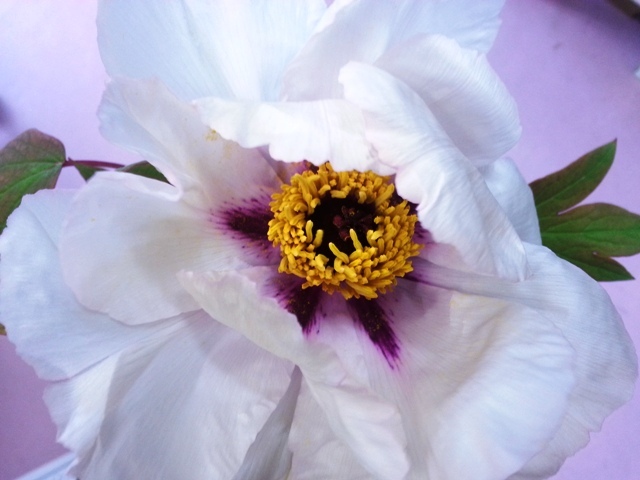 I’ve added a picture of a Peony Rose that was brought in to me on Saturday by one of our regular customers. She handed it to me saying, “I just thought you’d like this.” She thought so very, very right! Such a stunning bloom. She hastened to apologise for it though, telling me peonies don’t smell very nice. Naturally I brought it straight to my nose expecting something offensive, thankfully perhaps all she meant was it didn’t smell as beautiful as it looks? There was so much thought and care in this gesture. With the bloom were a couple of extra stems of leaves and they were all wrapped up in a wad of wet newspaper surrounded with a piece of reused plastic. Three days later and the joy I continue to feel each time I notice it seems to expand rather than lessen as you might expect. Just like the way the positive interactions I have with the many people I meet here, linger and hang around me, no doubt providing me with the extra energy to offer back to the next person who comes through the doors.